Forks Bitcoin Cash (BCH) and Bitcoin SV (BSV) have posted astronomical gains following Bitcoin’s run up to $5,000. After getting decimated by the hash wars following BSV’s split from BCH, it appears that the bull trend has revitalized the two projects. Within the last 24 hours, bitcoin accelerated from $4,200 to $5,000 within 50 minutes. The jump in price was unexplainable at the time, but reasons ranging from a massive buy-order to a string of short squeezes have been offered as explanations. Gains in the three hours following Bitcoin’s run-up were concentrated in BTC. Now that bitcoin is holding above $4,600, it appears that investment is flowing back into altcoins. The numbers support this, with Bitcoin up 18 percent in the last 24-hours while the overall market is up 19 percent. Meanwhile, to the surprise of some, two of the top gainers are Bitcoin forks BCH and BSV. Now, it appears that the renewed confidence in Bitcoin is being manifested in extraordinary gains in its forks. 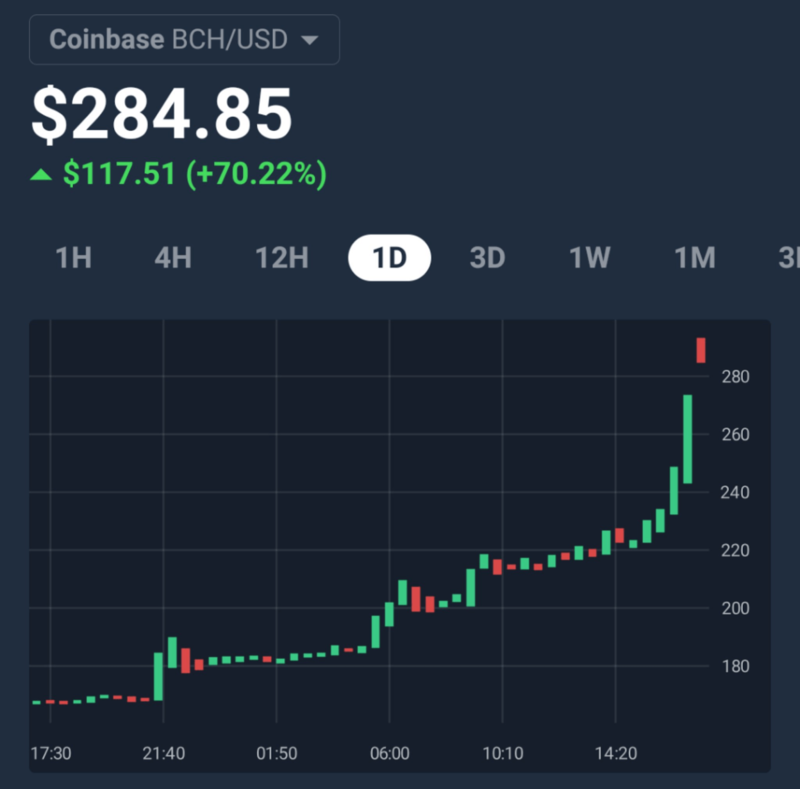 Within the last three hours, Bitcoin Cash has seen incredible buy-side pressure, going from $167 and peaking at $300 before settling above $250—gains of over 60 percent. Meanwhile, Bitcoin SV saw similar gains within the same time frame. In the same three hour period, the price of SV grew from $65 and peaked at $95 before settling above $85. Volume for SV also more than quadrupled, going from a 7-day average trading volume of approximately $100 million to 24-hour volume of over $450 million. Bitcoin Cash was the product of an August 2017 fork. Roger Ver, a former BTC core developer, argued that Bitcoin needed to more effectively scale for widespread adoption. Ver pushed for an increase to the protocol’s block size limit. The Bitcoin community was resistant to the change on the grounds of security and accessibility, as larger blocks would potentially make the network more centralized due to its impact on smaller miners. The disagreement culminated in a fork that split the communities, with Bitcoin trading at $2,700 and Cash at $240 at the time of the fork. Part of the coalition for Bitcoin Cash included Craig Wright, a computer scientist who claims to be Satoshi Nakamoto. In November of 2018, a subsequent dispute between Wright and Ver over increasing the block size (once again)—along with other points of contention—resulted in another split which created Bitcoin SV (Satoshi’s Vision). The split between Cash and SV decimated the price of both coins. Prior to the split, Bitcoin Cash was trading at $425. After the split, Cash was trading at $290 and SV at $95. Both projects saw their prices deteriorate as the hash wars went on, with large miners from both coalitions attacking each other’s blockchains. Now, however, both Bitcoin forks are showing outstanding performance. That said, confidence in altcoins overall appears to be growing. Within the last 24-hours, Bitcoin dominance hit a peak of 52.3 percent and has since tapered off to 50.4 percent. As such, it’s possible other altcoins will experience similar double-digit jumps. The post BTC forks post astronomical 24 hour gains, Bitcoin Cash up 60%, Bitcoin SV jumps 40% appeared first on CryptoSlate. Previous: Previous post: Following bitcoin’s 19% surge, crypto explodes: bull market in the works?